Adding a “feature screen” to your outdoor area is not only innovative and decorative, but it provides you with a very functional purpose. Having a screen built in your outdoor area can provide you with many benefits. If you wish to completely block out the area behind the screen (so no one can see a thing), then it is best to build a screen using blue board because it is a solid material. You could then either paint or render your blue board to complement your existing home. 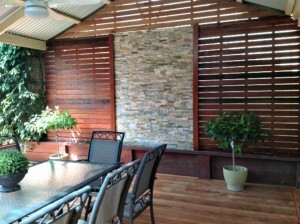 For a partial block out, you could build a “decking screen” using decking boards such as Merbau or Spotted Gum. The boards are used to create the screen over the treated pine framework. These types of screens are great to have to match your new decking because is allows the areas to be complimentary to each other. If the purpose of the screen is to not “hide” anything and it is being built as more of a feature, you could use a timber or plastic trellis or even a metal feature screen since they are see-through. Metal feature screens allow you to have a specific design “cut out” of it and provides you with a rustic look. The trellis and metal screens are not ideal if the purpose of the screen is for privacy or concealment reasons. As you can see, feature screens are a great benefit to any outdoor area. Once your feature screen is built, we recommend adding some garden lighting to light your screen up at night time to really show it off.